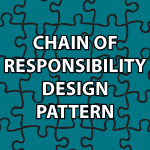 Welcome to my Chain of Responsibility Design Pattern Tutorial! Wow, that was a mouthful! This pattern has a group of objects that are expected to between them be able to solve a problem. If the first Object can’t solve it, it passes the data to the next Object in the chain. In this tutorial, I’ll use it to make the right calculations based off of a String request. While that is pretty simple the capabilities of this pattern are endless. The code follows the video to help you learn. // them be able to solve a problem. i didnt back again. i was always here. cos i have learned a lot from you. your recent topic is java so i am little bit irregular in this blog. i like your php, wp, css tutorials. Thanks. would you help me to know how to use email template ? There is a coding error. In class Numbers method is misspelled. So in some classes there is an error. Could you correct getcalcWanted to getCalcWanted, please? I fixed that. Thank you for pointing out the error. I have no idea how I did that? Even my english not very well I find that your presentation and material are very good and perfect and easy to understund. We are waiting and waiting for other courses to explore and to understand Java and design pattern. You are great! I love your tutorials! But mabe I’m stupid, but I wonder how you know how meny classes you need for this pattern to work out? Is it always this many?